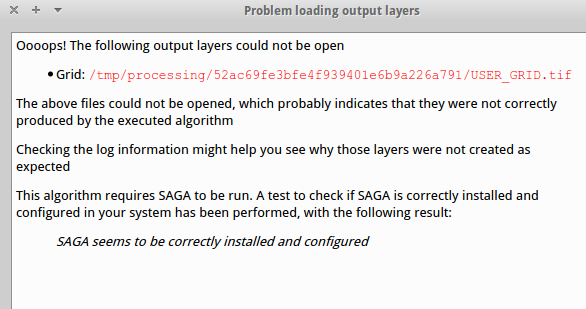 I have been getting this error when trying to create kernel density maps using QGIS 2.0.1 and SAGA 2.1.0. It seems to occur only when the extent is large, i.e. the entire state of Texas. If I do it on a smaller region, it works well. This occurs with any combination of settings. I also get the same error any time if I try to do any sort of Kriging, regardless of parameter settings. I have attached the error message I got and the settings I used this go-round. The log file is at the bottom. Any ideas? I am sure others are experiencing this issue as well. I am on Ubuntu 13.04. As underdark pointed out, you are running out of RAM. How much RAM do you have? 64 bit system or 32 bit? SAGA GIS always puts all datafiles completely in memory. This is one of the reasons why it is so fast, but it fails on huge files. Increase the grid resolution to eg 200m. You may also try to run the command directly from the command line or saga gui, when qgis is not taking up memory. If you do require full resolution and the above solutions don't work you could try enabling file cache in saga gui (you will have to run through gui, afaik this is not supported in saga_cmd): in the manager window click the data tab and click again on data in the top of the tree. In the settings window you should now find an option "grid file caching". You can enable automatic mode here. Performance may be very poor when doing so. I'd really recommend increasing the grid resolution if that is an option. Not the answer you're looking for? Browse other questions tagged qgis error saga kernel-density or ask your own question. 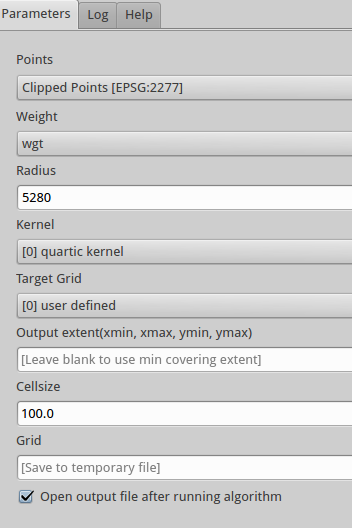 How to use SAGA Kriging in Sextante for QGIS?